A mystery trader known to derivative traders and analysts as “50 Cent” has dropped millions of dollars betting that the markets will go crazy. As Bloomberg’s Luke Kawa reported in January, the trader gets his or her name from their propensity to buy option contracts on CBOE Volatility Index, or VIX, futures that cost 50 cents. This person is targeting options that would profit if the index spikes sharply — something that would follow a big drop in stocks. With stocks inching higher, and making only small moves lower, the VIX is near historic lows of around 11 right now. The “50 Cent” trader has been placing bets that it will spike — over 19 or 24 depending on the contract. Data from Bloomberg shows the trader has been losing money on these trades since early January, betting $US33 million in that month alone. That hasn’t stopped this person. 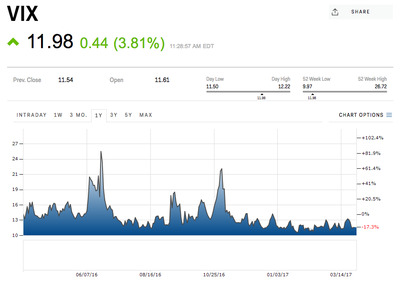 On March 30, 50 Cent struck again, buying 50,000 VIX calls with a $US21 strike price and 15,000 VIX calls with a $US20 strike price, both expiring in May, according to CNBC. CNBC’s tally shows that the trader has spent $US90 million in VIX options thus far and has lost $US55 million in contracts that have expired worthless. 50 Cent’s transactions have traders dumbfounded, the only explanation is that after so many weeks of subdued volatility, this trader thinks some kind of significant correction is coming by May. For 50 Cent to make money he or she needs the VIX to jump more than 80% in the next month or so.